Mein Schiff 3 was christened by German singer and entertainer Helene Fischer today. Tomorrow, the ship sails her maiden voyage from Hamburg to Le Havre, La Coruna, Lisbon, Cadiz and Palma. For the summer, she will be sailing alternating itineraries from Malta - to the Western Mediterranean and to the Adriatic. Mein Schiff 3 repositions to the Canary Islands for the winter season. 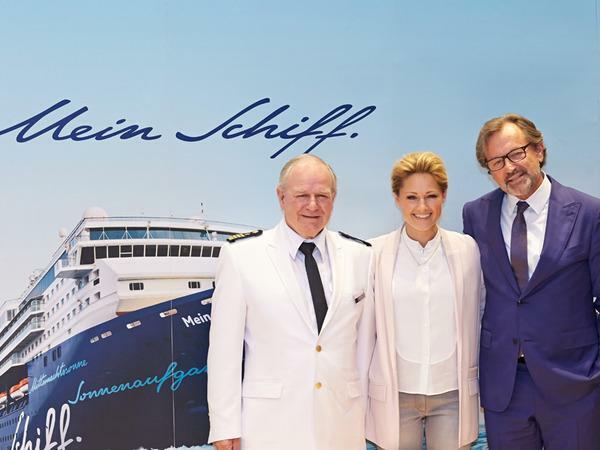 Photo: Captain Kjell Holm, Helene Fischer and Richard Vogel, CEO of TUI Cruises.